A median-income household cannot afford an average-priced new car in 24 out of the 25 largest US metropolitan areas, according to a study out today by financial services firm Bankrate. The one market where a median-paid family can truly afford an average-priced new car is Washington, D.C. 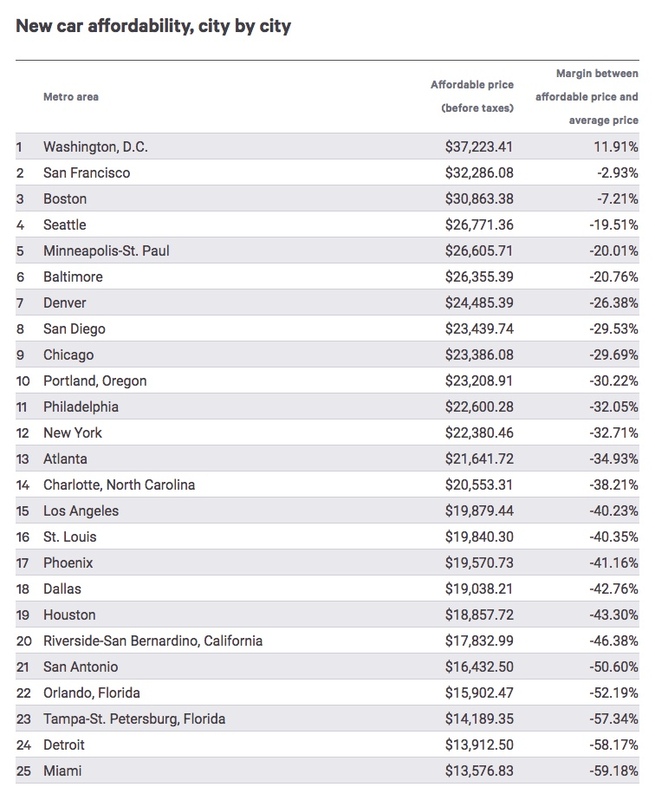 The area where a car was least affordable? Miami/Fort Lauderdale/West Palm Beach. There, a median-income household can afford to buy a car worth just $13,577. Yet the average price for a new car, SUV, or pickup sold in the US in May was about $33,300, according to Kelly Blue Book. Now, it's true that the study is looking at median household income in each of these metro areas - meaning that something approaching half of the household incomes are higher and probably can afford a new car. But the flip side: At least half definitely can't. The study used the "20/4/10" rule of car financing: 20 percent down payment, four-year loan, and principal/interest/insurance payments constituting 10 percent of a household's gross income. If a median-income household actually followed those guidelines, it could afford less than half the price of a new car in six of the 25 metro areas. "In the past 35 years, the cost of a new car has gone up 35 percent, a used car is up 25 percent, and at the same time, the median household income is only up 3 percent." But the reality is, families aren't following the 20/4/10 rule - not even close. They are stretching beyond their means. Combine that with the stretching they have to do to afford a mortgage, and it's no wonder Americans' homeownership rate is down and their personal savings rate, while recently improved, was not long ago second-worst in the developed world. As all too many of us know, this is what the American dream looks like. "The main point of this research is to illustrate how Americans are having to overextend themselves to pay for a new car at today's prices," says Bankrate analyst Claes Bell. "Low- and middle-income households are having to stretch loan terms to six or more years and/or spend huge percentages of their paychecks to afford reliable transportation, and it's very difficult to get off that hamster wheel of debt once you're on it." Even today's average used-car price of around $19,200 would be hard for households in eight of the biggest metro areas. "In the past 35 years, the cost of a new car has gone up 35 percent, a used car is up 25 percent, and at the same time, the median household income is only up 3 percent," Michelle Krebs, a senior analyst for Autotrader, told Bankrate. As Bankrate's Bell pointed out, one way consumers bridge the affordability gap is with longer-term car loans. These days, three quarters of new-car loans are written for longer than five years, and the number of loans with terms as long eight years is on the rise, according to Experian. And of course, there's leasing. In the District of Columbia, where the median household income of nearly $100,000 is about twice as high as in South Florida, a median-income household can afford to spend $37,223 on a car ($697 per month). But even there, Bell cautions that the figures apply to the entire household. "So if you're making payments on two cars, you're looking at a couple of $350 monthly bills, not a pair of brand-new luxury cars," he adds. Here are the rankings. More on the study is available here.